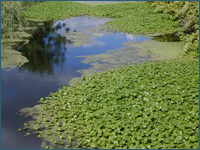 Invasive aquatic plants can take over your pond and potentially be transferred from your pond into the wider environment. In many cases even a small fragment of a plant moved to a water course outside your pond can form a new population in the wild. Avoid swapping cuttings or fragments from friend’s ponds. Otherwise you may end up with an invasive species in your pond. You may also be unwittingly transporting invasive hitchhikers. Plants that you buy for your pond could be carrying hitch-hikers too. You can avoid these by washing your plants in a bucket before putting them in the pond, then emptying the bucket over the lawn or flower bed away from any watercourses or drains. It is not recommended that you collect plants from the wild. Some plants are protected and you may unwittingly cause damage to the environment. Here are six examples of invasive aquatic plants that you might find in your pond. More information for each of these species and other invasive species can be found on the Most Unwanted Section of this website. If you do discover an invasive species, don’t panic – just ‘Be Plant Wise’ and remember to dispose of the plant by composting it. Floating pennywort was first brought Ireland and Northern Ireland as a plant for tropical aquariums and ponds. It has since escaped into the wild. Where it has escaped into the wild it is usually found in slow-flowing water on the edges of rivers and lakes and in ditches. 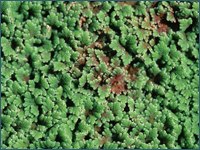 It forms dense interwoven mats of vegetation. These can look like solid land and so be a danger to children and livestock. This plant grows faster than most native aquatic plants, blocks out light and can stop fish accessing feeding and resting spaces. It can also cause localised flooding by blocking drainage systems as well as affecting the amenity of a waterbody by interfering with activities such as angling and boating. Floating pennywort can grow very quickly – up to 20cm a day. It is easy to confuse this plant with other species. You can use the identification sheets produced by the GB Non-native Species Secretariat to help you make sure you’ve identified them correctly, or ask your pond plant retailer for help. Curly leaved waterweed was recorded in Lough Corrib, County Galway, where it is aggressive freshwater weed. It has also been recorded at a number of sites across Ireland and Northern Ireland. This species can affect some recreational activities such as swimming or boating as well as the ecology of freshwater systems. 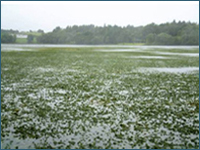 In areas of Lough Corrib where Lagarosiphon is well established, studies have revealed that it has a significant negative impact on native macrophyte communities. Beneath the dense canopy cover produced by the plant, virtually no light can penetrate. In bays previously covered by extensive charophyte meadows, only Lagarosiphon is now present. The dramatic changes post-infestation in the bay are also clearly visible from above the surface. Experience from outside Ireland suggest that in spite of one of its common name ‘oxygen weed’ in a dense infestation of Lagarosiphon major there often is less oxygen present than in the surrounding water. 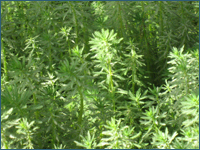 Lagarosiphon major – may be sold incorrectly as Bunched Elodea Crispa Oxygenating Plants. Identified by a long stem that is brittle and easily broken (aiding dispersal) and its leaves that are strongly recurved and are arranged in whorls or in a spiral arrangement. Surprisingly, in Ireland, the most active growth occurs during the winter. Capable of forming very dense infestations in suitable habitats and occupying the full water column in waters up to 6m deep with significant impacts on native plants, insects and fish. Serious threat to tourism, angling, boating and other recreational pursuits as well as conservation goals. Parrot’s feather is native to Central and South America. Where it has escaped into the wild it is found in still and slow-flowing water and can be submerged or emerging from the surface of water. It persists throughout the winter and can be found growing on land when ponds dry out. It is usually bought as an oxygenating plant and to provide cover and food for fish. It can rapidly dominate a water body, creating a thick raft of vegetation which can displace native species. It can contribute to localised flooding by blocking watercourses and drainage channels. Parrot’s feather is distinctive because of its blue-green colour, feather-like leaves and emergent stems. A fragment as small as 5mm can re-grow. Can produce a thick raft of vegetation. (Crassula helmsii – also sold incorrectly as Crassula recurva, Tillaea recurva and Tillaea helmsii). New Zealand pigmyweed is not currently widespread but is likely to spread much further in Ireland and Northern Ireland. 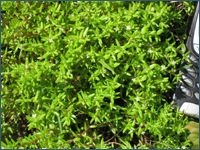 Where it has escaped into the wild, New Zealand pigmyweed is found in slow-flowing or still water that is up to 3m deep such as ditches and on the edges of lakes, where it forms dense vegetative mats that out-compete most native aquatic plants. This can lead to large fluctuations of oxygen in the water body and the blocking out of light, affecting other plants, fish and invertebrates as well as increasing the risk of localised flooding by blocking drainage systems. New Zealand pigmyweed grows both in and under water as well as on land by water. It is readily recognisable when growing at the edges of water bodies by its fleshy leaves, but is less easy to see when submerged under water. Its submerged form can look quite different to its land form, so check the GB NNSS identification sheet. It produces tiny white flowers from July to September. 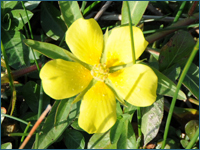 These types of water-primrose were introduced to Europe from South America as ornamental and water garden plants. They have only been recorded at a few sites in the UK and one site from Ireland, but in France, where they are much more widespread, they are causing considerable damage and costing several million Euros a year to control. Currently only recorded from one site in Ireland. Not recorded in Northern Ireland. Water fern is a floating aquatic plant native to tropical America. The leaves of water fern are no bigger than 2.5mm – forming small plants around 2.5cm long which cluster to form a dense mat. Water fern floats on the surface of the water by means of numerous, small, closely-overlapping scale-like leaves, with their roots hanging in the water. Water fern can readily take over areas of freshwater, and grow at great speed – doubling its biomass every two to three days. It is green in summer but usually turns a distinctive reddish colour in autumn and winter. When this plant completely covers the water surface, it can be a danger to children, pets and livestock who may attempt to walk on it. It also reduces oxygen levels in the water. As each individual plant is so small, it is known to be transported on other plants as a contaminant. Find out about alternative species which may be suitable for your garden pond.